Hedge Funds Are Fleeing Nordson Corporation (NDSN): What Did They Find Out? The 700+ hedge funds and money managers tracked by Insider Monkey have already compiled and submitted their 13F filings for the third quarter, which unveil their equity positions as of September 30. We went through these filings, fixed typos and other more significant errors and identified the changes in hedge fund positions. Our extensive review of these public filings is finally over, so this article is set to reveal the smart money sentiment towards Nordson Corporation (NASDAQ:NDSN). Is Nordson Corporation (NASDAQ:NDSN) a healthy stock for your portfolio? Money managers are getting less bullish. The number of long hedge fund bets that are revealed through the 13F filings slashed by 8 lately. NDSN was in 14 hedge funds’ portfolios at the end of September. 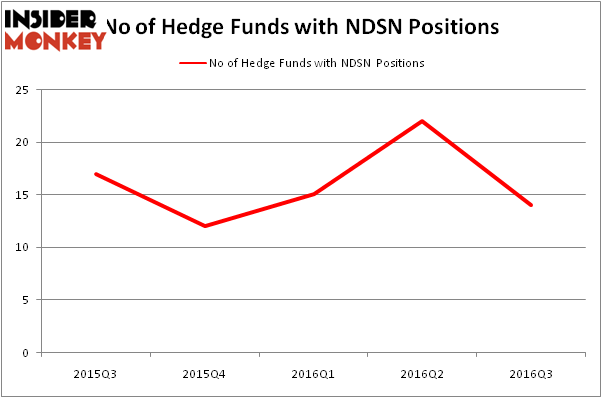 There were 22 hedge funds in our database with NDSN positions at the end of the previous quarter. At the end of this article we will also compare NDSN to other stocks including Live Nation Entertainment, Inc. (NYSE:LYV), Banco Bradesco SA (ADR) (NYSE:BBD), and Alnylam Pharmaceuticals, Inc. (NASDAQ:ALNY) to get a better sense of its popularity. How have hedgies been trading Nordson Corporation (NASDAQ:NDSN)? Heading into the fourth quarter of 2016, a total of 14 of the hedge funds tracked by Insider Monkey were long this stock, a 36% tumble from the second quarter of 2016. By comparison, 12 hedge funds held shares or bullish call options in NDSN heading into this year, so ownership is still up for the year after nearly doubling in the first half of the year. With hedge funds’ positions undergoing their usual ebb and flow, there exists an “upper tier” of noteworthy hedge fund managers who were increasing their stakes substantially (or already accumulated large positions). Of the funds tracked by Insider Monkey, Royce & Associates, led by Chuck Royce, holds the biggest position in Nordson Corporation (NASDAQ:NDSN). Royce & Associates has a $44.2 million position in the stock. The second largest stake is held by Millennium Management, founded by Israel Englander, which holds a $13.9 million position. Remaining members of the smart money that hold long positions comprise Jim Simons’ Renaissance Technologies, Mario Gabelli’s GAMCO Investors, and Roger Ibbotson’s Zebra Capital Management. We should note that none of these hedge funds are among our list of the 100 best performing hedge funds which is based on the performance of their 13F long positions in non-microcap stocks. Is Cryolife Inc (CRY) A Good Stock To Buy? Hedge Funds Are Selling Concordia International Corp (CXRX) Is 2U Inc (TWOU) A Good Stock To Buy? Is Tobira Therapeutics Inc (TBRA) A Good Stock To Buy? Is Cohu, Inc. (COHU) A Good Stock To Buy Right Now? Is Bottomline Technologies (EPAY) A Good Stock To Buy?